It had been a good long while, Queen Fyora thought sadly, since she'd seen such destruction. Not for ages had she been forced to bear witness to that level of violence... and this time, this senseless loss was her own doing. Of course she could not have known that it would come to this; she was not some omniscient deity, much as the people of the world seemed to view her that way. Still, the guilt would not ebb. She might not have foreseen what had transpired, but she should have done. Once—impossibly recently, from the immortal faerie-queen's perspective—Xandra had been an innocent, a child. Fyora could vividly recall the day not all that long ago when the Xweetok had been brought before her, wide-eyed and eager and having been hailed as brilliant, a prodigy by every sorcerer and mage in Faerieland. Her abilities were so far beyond what should've been possible at her young age that even Fyora had been surprised, and the child had been so hungry for knowledge that there had been no alternative... there was simply no one apart from the faeries themselves who could offer her more education. Power like that—the sort born once in a generation, if that—needed to be controlled, too, and it had been for a time. But, like all children, Xandra grew up and become aware of more than the all-consuming thirst for knowledge she'd felt her entire life. Precisely when the darkness that had obviously been festering in her heart had taken hold was a mystery, but like all sickness, it had to have come from somewhere... and Fyora felt she should have seen the symptoms. 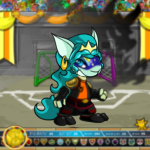 To say that she'd been blindsided by recent events was an understatement, and if there was one being in Neopia who could never afford to be caught off guard, it was her. Could anyone have blamed her, though, for having wanted to see only the best in the girl? The life of any mortal creature was a brief thing, and Fyora had seen so many mortal lives begin and end, but Xandra had been special. Close contact with mortal beings was something Fyora had on a regular basis, but close personal relationships with them were another matter entirely. To get to know them better was to set herself up for heartbreak in the end; she would outlive them all, and the pain of losing them would only be worse if she became attached, if she grew to love them any more than she loved all living things. But she'd had no children, and never would. When she'd taken Xandra under her wing, maternal instinct had taken over and she'd come to view the Xweetok as her own daughter. With every new discovery, with every point of progress Xandra had made, Fyora's love for her had grown... and it had been that love that had made her blind. The faerie-queen had, since she'd reawakened from petrification, been telling herself that if there had been signs, if there had been any indication, she'd have acted... but now, in retrospect, she could see that there had been plenty of signs... she simply hadn't wanted to acknowledge them. For instance, there had been a day some years ago when she'd been observing Xandra practicing a few more complicated spells. It was the type of magic that took years to master, and Xandra, per usual, had been barreling through it with little difficulty. But then one of the spells had gone wrong, and in her frustration, Xandra incinerated a bird that had been singing nearby. Fyora had scolded her sternly, of course, and had given her a lecture about how all life was precious and should never be taken without just cause... and it had seemed as though the talk had sunken in, at least partially. Killing the bird had been wrong, of course, but Fyora had told herself that she knew Xandra, and that the girl wouldn't do something like that ever again. She'd been raised better, hadn't she? Now, having seen what Xandra had always been capable of—tearing an entire city and its people from the sky—Fyora wondered if things could've turned out differently had she been less involved, less attached. In ages to come, one she'd loved as her own offspring would be remembered for an act of ruthless anarchy. In all likelihood, Fyora would be the only one to mourn. Xandra was not dead in the sense that she could never be returned to life, but she might as well be. It would be centuries, possibly longer, before the faerie-queen could hope to try and rehabilitate her without an incredible backlash from her people. Attempting to reform the sorceress too soon could be dangerous for others too, others Xandra might feel had wronged her. Those individuals had a right to live their lives without fear of an enemy defeated. Only when they were gone, and their children were gone, and their children's children were gone and Xandra's name was little more than a dark myth could Fyora even think of being reunited with her pupil... and even then, it might not ever be possible. Xandra's misdeeds would live on in the memory of Neopia for a long, long while, for as long as Faerieland remained on the ground. There was no time to dwell on that sad reality now, though; there was too much work to be done. Life would go on, after all... it always did. Disaster could strike a thousand-thousand times and yet life would prevail in the end. She had seen it happen before, and would likely see it happen again; such was the price of an ageless existence. Faerieland's stalwart citizens had already begun rebuilding, as had her faerie sisters. As she gazed out from the shattered windows of her palace, she could see several new buildings had gone up and that there were more in progress. Help was pouring in from every corner of the globe; the heroic souls who'd first responded to the faeries' crisis had stayed on to provide what aid they could give. Fyora smiled at the sight of a familiar Kougress maintaining law and order as relief packages were doled out... and at an equally familiar Ixi always in her shadow. Fyora was old. She'd seen the lives of countless Neopians play out, and though it might not be obvious to the pair of them, it was clear to her how their stories would end. In a way, their future was analogous to the future of the world itself. They would live well, growing closer together and leaving what probably seemed to them a small—though bigger than they knew—mark on the world. There would be children in their future, and all the joy that young love and new life could bring. Love, in the end, was what had saved the world and insured that there would be a future in the first place. But wasn't that always the way things went? Eternally, in the face of rage and hatred and darkness, love and light restored balance. It was why, even though the world--to those she ruled--seemed to have ended, she knew it had merely been changed. So long as there was love in the world, life would go on. It was late summer now, but autumn would come, and winter after, and then the spring... and so on.